Method: Wide-ResNet-28-10 trained with CIFAR-10 augmented images by best found policies, and with unaugmented images (everything else same). DeepAugment is designed as a scalable and modular partner to AutoAugment (Cubuk et al., 2018). AutoAugment was one of the most exciting publications in 2018. It was the first method using Reinforcement Learning for this problem. AutoAugmentation, however, has no complete open-sourced implementation (controller module not available) preventing users to run it for their own datasets, and takes 15,000 iterations to learn (according to paper) augmentation policies, which requires massive computational resources. Thus most people could not benefit from it even if its source code would be fully available. For achieving the second goal, user interface is designed in a way that it gives user broad configuration possibilities and model selections (e.g. selecting the child model or inputting a self-designed child model). DeepAugment makes optimization of data augmentation scalable, and thus enables users to optimize augmentation policies without needing massive computational resources. As an estimate of its computational cost, it takes 4.2 hours (500 iterations) on CIFAR-10 dataset which costs around $13 using AWS p3.x2large instance. 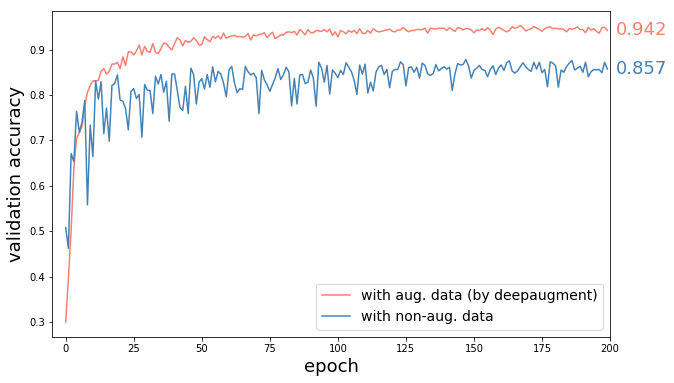 To our knowledge, DeepAugment is the first method which utilizes Bayesian Optimization for the problem of data augmentation hyperparameter optimization. Three major components of DeepAugment are controller, augmenter, and child model. Overall workflow is that controller samples new augmentation policies, augmenter transforms images by the new policy, and child model is trained from scratch by augmented images. Then, a reward is calculated from child model's training history. This reward is returned back to the controller, and it updates its surrogate model with this reward and associated augmentation policy. Then, controller samples new policies again and same steps repeats. This process cycles until user-determined maximum number of iterations reached. Controller can be set for using either Bayesian Optimization (default) or Random Search. If set to Bayesian Optimization, samples new policies by a Random Forest Estimator and Expected Improvement acquisition function. In hyperparameter optimization, main choices are random search, grid search, bayesian optimization (BO), and reinforcement learning (RL) (in the order of method complexity). 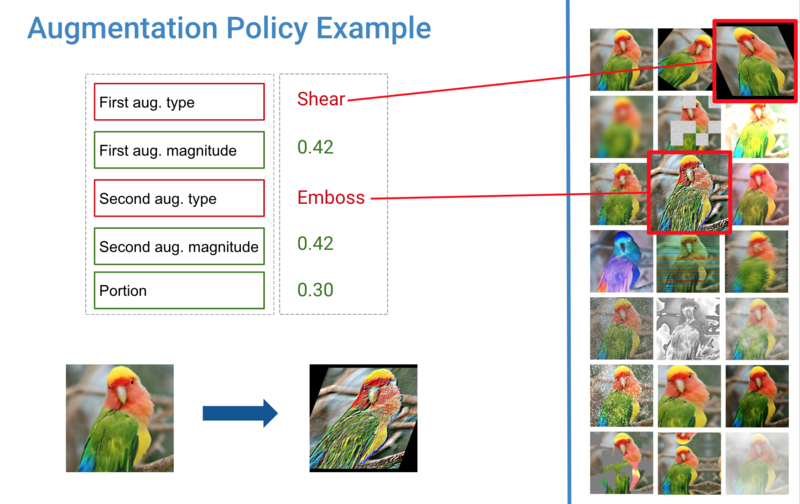 Google's AutoAugment uses RL for data augmentation hyperparameter tuning, but it takes 15,000 iterations to learn policies (which means training the child CNN model 15,000 times). Thus, it requires massive computational resources. 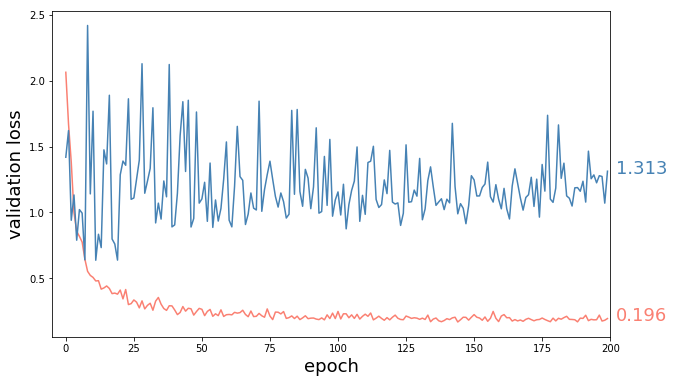 Bayesian Optimization on the other hand learns good polices in 100-300 iterations, making it +40X faster. Additionally, it is better than grid search and random search in terms of accuracy, cost, and computation time in hyperparameter tuning(ref) (we can think optimization of augmentation policies as a hyperparameter tuning problem where hyperparameters are concerning with augmentations instead of the deep learning architecture). This result is not surprising since despite Grid Search or Random Search BO selects new hyperparameter as informed with previous results for tried hyperparameters. Reward function is calculated as mean of K highest validation accuracies of the child model which is not smaller than corresponding training accuracy by 0.05. K can be determined by the user by updating opt_last_n_epochs key in config as argument to DeepAugment() class (K is 3 by default). train_set_size: size of the training set during optimization. It should be small enough that computation will not take too long. opt_samples: number of samples optimizer will run for each augmentation-policy. Training of the child model is stochastic and validation accuracy results might be slightly different from run to run. The tool trains child model three times by default and takes average, in order to have more robust accuracy results. opt_last_n_epochs: number of non-overfitting epochs whose validation accuracy average will be used as reward. For each training, opt_last_n_epochs highest validation accuracies (where its difference to training accuracy is not more than 10%) are averaged and taken as reward. child_first_train_epochs: if not 0, child model is pre-trained without any augmentation and its resulting weights are load for each training with augmentation. The purpose is training child model 10-20 epochs once and thereby saving 10-20 epochs for each training of optimizer iterations which is +100 times. logging: logging object for getting news about the optimization. notebook_path: path for recording all trainings in all iterations. For each iteration, training history, trial-no, sample-no, calculated reward and mean recent validation accuracy is recorded. Records is updated at each trial for ensuring records are not lost in case optimization interrupted unintentionally. Records can be found at "/reports/experiments//notebook.csv"
Note: Versions from 0.0.0 to 1.0.0 are considered as alpha phase and do not follow this strategy.